Now that summer is here and all is right in the world of wild Whooping Cranes, we can sit back and reflect back on this phenomenon called spring migration. 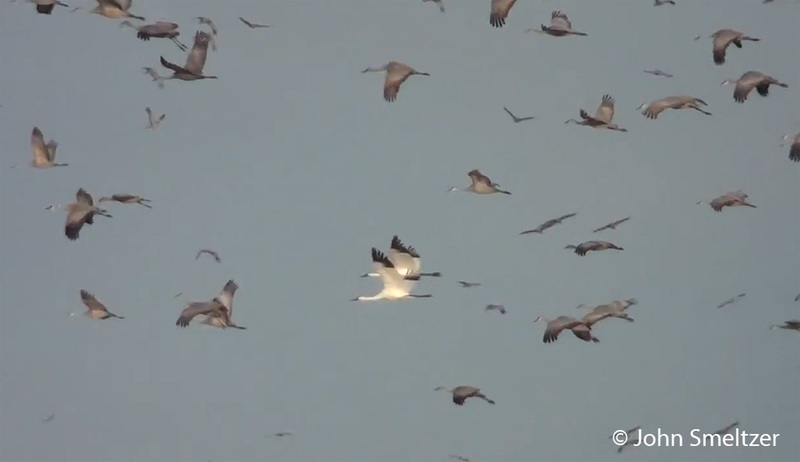 Every year, the Central Flyway becomes alive with hundreds of thousands of Sandhill Cranes making their northern journey to their nesting grounds. During the migration, most will make a stopover at Rowe Sanctuary and if you’re lucky, you may see one or two wild whooping cranes among them. Throughout his career in Wildlife Management, John says that he “only saw three birds in the wild around Larimer County in NE Colorado … and only single birds “hanging out” trying to figure the world out”. John has been fortunate enough to have witness the Great Migration that occurs each spring at Rowe Sanctuary in Gibbons, Nebraska. He has graciously given FOTWW the opportunity to share his videos. We are posting John’s videos below, recorded from a blind at Rowe Sanctuary and we will let you enjoy the moments along with his own thoughts and words. FOTWW thanks John Smeltzer for sharing these videos with us so that we can share them with you. We hope that you enjoy them. Sit back, relax, and turn up your volume. Whooping Cranes – Rowe Sanctuary Photo by John Smeltzer – Click on photo to enlarge. Wonderful article with tremendous Sandhill and Whooping Crane videos.